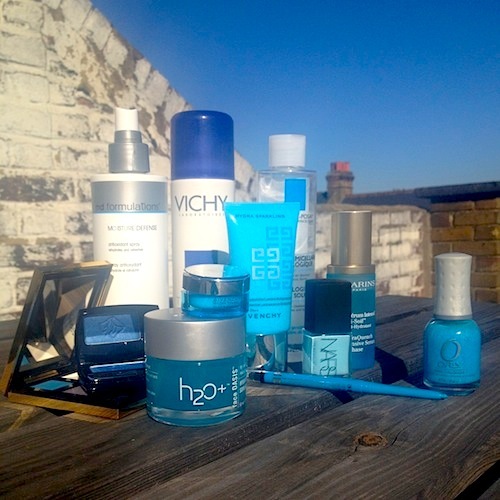 The sky was so blue the other day that I felt moved to collect together lots of blue beauty products and take photos of them. This might seem like a horrendous waste of time, but I had a pressing deadline and when I have a deadline I will do almost anything other than the thing I’m supposed to be doing. The closer the deadline, the more bizarre my actions become. Things I start doing include: cleaning the shelves from the oven, sorting out the spices cupboard and putting beauty samples into various categories. Blue things, then. Doesn’t this image make you want to go on holiday? Oh, I’m sorry, I am on holiday! At least I will be by the time you read this. I’ll be sunning myself in Greece next to my pool, no doubt arranging beauty samples into weird and wonderful categories. Last year on holiday I made a whole category out of “products with packaging that looks like stone”. Needless to say it didn’t make it onto these here pages. YSL’s “Facebook” Palette – not many of these made with the (slightly tacky) “Devoted to Fans” lid, but actually, the exact same quad is available at FeelUnique.com with the standard gold-coloured case! Lancome Ombre Hypnose in “Bleu de France”, at FeelUnique.com. Great on olive complexions, use wet for an intense colour or dry for a seaside wash of blue!